It’s important to have complete set tools and the knowledge of how to use them to safely complete any DIY project. It is also fair to say that many of us are over-confident in our home improvement abilities. Here are some tips about essential DIY tools and how to use them. want to invest in equipment that you only plan on using once, consider hiring a contractor to do the work. Some of the most common DIY incidents are due to ladders being used improperly, or not being used at all. Stop using an old chair to support you when you’re working above your reach, and start following some simple safety guidelines to minimize your risk. For example, make sure the ladder you use in good condition and is set up properly on even ground. Don’t assume that just because a step ladder is small that you don’t need to be as cautious as you would with an extension ladder. Step ladders aren’t suitable for every job, even inside your home or greenhouse. If, at any point, your DIY job requires reaching above a comfortable height, you’ll need to use an extension ladder instead. This goes for painting or cleaning walls, emptying gutters and washing tall windows (or, even better, use a power-washer for high-reach jobs). Just like a step-ladder, take the time to check that the rungs are in a good condition and that the ladder is extended and positioned safely before climbing. A toolkit-standard, this wrench is also called a crescent wrench. The biggest risk with an adjustable wrench is that you won’t be holding it properly, causing it to fall and hurt your hand, arm, leg or foot. Avoiding these injuries is fairly simple; check that the wrench and grip are in good condition, loosen it to fit the bolt then tighten it thoroughly. make sure the blade is sharp (to avoid putting a dangerous amount of unnecessary pressure into your movements) and keep all body parts well-clear of the cutting line. Make sure you’re working on a stable surface and stay focused on what you’re doing. One of the most basic DIY tools is the claw hammer. 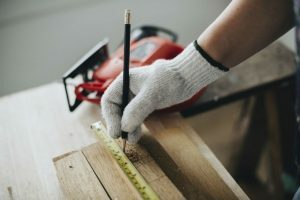 It is an essential part of any tool kit and can be used for a wide variety of chores – far more than just hammering nails. Due to its usefulness, it’s also one of the most likely tools to injure yourself with, so if you want to avoid a nasty accident with your finger or hand, at least make sure you’re following the standard hammer safety rules – for example, only using the hammer on a flat surface. Locking pliers are another common tool, and seem so simple that many DIY-ers become over-confident and end up using them incorrectly. Never use any kind of pliers for a job that should be completed using a different tool. Take the time to find your screwdriver, hammer or wrench instead. You’ll only end up damaging the pliers or, worse, applying too much force and slipping. Anything motorized immediately poses a more serious risk and cordless drills a frequent cause of DIY injuries. 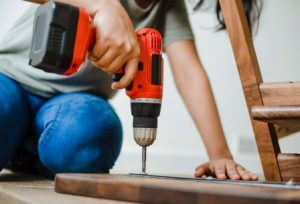 For most DIY tasks, a manual tool can be used, but when it comes to securing screws in walls or furniture, sometimes the best alternative is a cordless drill. Make sure to read and follow the safety instructions that are included with the drill before using it, even if you’ve used a similar tool previously. Drills are heavy and cause serious injury when dropped. They can also be particularly interesting to children, who mistake them for toys or simply do not realize the associated hazards. Dakota Murphey follows the latest gardening trends from various news and brands including Precipitous.co.uk and RockSaltShop.co.uk.